The Pennsylvania Housing Finance Agency (PHFA) works to provide housing solutions for seniors, low- and moderate-income families, and people with special needs. Since its inception in 1972, PHFA has managed more than $14.1 billion of funding for more than 175,000 single-family home mortgage loans, helped fund the construction of 134,507 rental units, and saved the homes of more than 49,500 families from foreclosure. Given the ongoing demand for its affordable housing programs, PHFA has been gradually adding staff to support the expansion of its current services and the potential addition of new housing initiatives. Almost ten years ago, PHFA recognized that it was outgrowing its existing headquarters in Harrisburg and started planning for its own expansion. In 2014 its fairly well-developed plans underwent some transformations. That was the year that PHFA first learned about Passive House and was persuaded to include an incentive program for Passive House in its Qualified Allocation Plan or QAP (see “Passive Affordable Housing—In a Growing Number of States,” Passive House Buildings: North American Highlights 2017, p.11). As Wade Romberger, staff engineer for PHFA recalls, some staff were reviewing plans submitted for the 2015 funding cycle and the question arose, Can we set Passive House as a goal for our new headquarters? The answer, after hashing the idea around and developing new cost estimates, was yes. The expanded headquarters actually encompass two buildings—a renovated roughly 9,000-ft2 historically significant structure next door to the existing headquarters and an adjacent new seven-story building. Together the two buildings will provide almost 40,000 square feet of new office space. 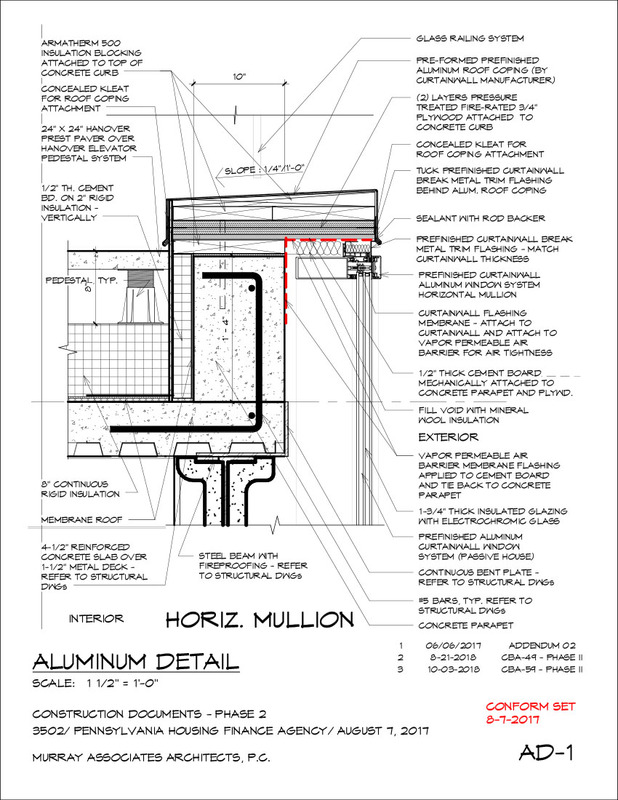 PHFA is aiming for Passive House performance for both buildings. The design of the new building was strongly influenced by the desires of the local neighborhood and historic preservation groups. These groups didn’t want the new building’s massing to dominate the historic residential neighborhood, and in fact wanted the building to be as close to transparent as possible. In a first for Harrisburg, the new office building will be predominately glass, with the top four stories each consisting of at least 75% glazing. The lower levels have much less glazing but are tucked into the surrounding structures. Extensive curtain walls were a responsive design solution to the neighbors’ concerns, but all that glazing presented a stumbling block for Passive House performance. Fortunately the same week that PHFA was figuring out what to tweak to meet its new and improved performance targets, it learned about two products that ultimately allowed it to marry its design and performance goals: Passive House-certified curtain wall framing and electrochromic glazing. The triple-pane electrochromic glazing lightens and darkens as programmed, optimizing solar gain and visible light to minimize the cooling load while also balancing daylighting needs with indoor-lighting energy use. Each pane in the curtain wall is separately controllable, with the largest, 5-foot by 10-foot, panes split into three individually programmable segments. This allows occupants to see daylight when they are seated at their desks through the higher subsections, while the lower ones are darkened to restrict glare and solar gain. At night the windows are fully darkened to prevent light pollution. The entire curtain wall and certain main structural building columns are supported using specialized, extremely high-psi structural foam. The foam is used as a thermal bridge barrier and is also load bearing. The nonglass portion of the façade relies on panels that are insulated on the exterior with 3 inches of polyiso and 6 inches of mineral wool for a total R-value of about 40. These high-R-value walls help compensate for the lower R-value of the curtain walls. The building’s relatively dense occupancy—120 staff members, all with computers and various other electronic equipment—translates into significant internal heat gains that drive down the heating demand but increase cooling and primary energy demand. Romberger and Kosick worked closely with the information technology department to find the most efficient computing solutions, eventually managing to cut the expected load by two-thirds. A variable refrigerant flow (VRF) system will manage the conditioning loads efficiently, especially when different areas call for simultaneous heating and cooling. A commercial-size ERV will bring in constant fresh air. A 27-kW roof-mounted PV system will help offset the primary energy demand. The beige color in the column base is 6-inch thick structural thermal break foam. This product’s compressive strength is higher than the concrete it sits on. The adjacent brick building that is being renovated is a stark contrast to the sleek glass building. In keeping with all retrofits, the project had its series of complications, starting with the stone rubble foundation. That needed extensive underpinning, adding weeks of work to the project, including hammering rock that could not be ripped. Eventually a new concrete bathtub, complete with air barrier membrane, was added within the existing foundation. The façade’s look had to be preserved, including all the double-hung configuration of the windows. Fortunately, the team was able to locate Passive House-certified landmark series windows that simulate the double-hung style. An expanding foam tape was used around the double-hung replica windows, doing double duty as the air barrier and the insulation in that space. The air sealing had to be done from the inside in order to preserve the exterior look. As the brick walls had deteriorated, the team decided to have what was essentially a second shell built interior to the brick, using two layers of gyp board, resting on structural foam. A liquid-applied air barrier was coated onto the interior of the exterior layer of gyp board, isolating it from potential penetrations. The comprehensive air barrier extends from the edges of the subfloor to the roof underdecking. This very constructible strategy avoided the potential “death by 1,000 cuts” that Romberger has witnessed on other Passive House projects where extensive time has had to be spent chasing small leaks. Construction started in December 2016, and the move-in date is slated for late spring. Although PHFA doesn’t have a handle yet on the project’s cost relative to conventional construction, it expects the budget to be in line with grade A commercial office building. There is no question that not that many years ago this project couldn’t have been completed at any price, because the Passive House-quality products that helped make this construction feasible weren’t available in North America. Thanks to this team effort, the expanded headquarters are allowing PHFA to increase the services it provides, delivering housing solutions to a growing clientele. But the new buildings’ benefits don’t end there; both the new and the renovated building are shining models of exemplary design and building practices.